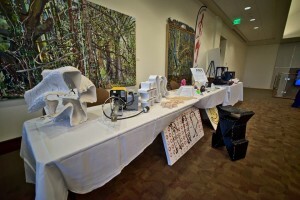 Last month, FSU’s Turnbull Conference Center hosted the second annual Stacking Layers Conference. The two-day event presented an exploration of 3D printing technologies and research for students, teachers, innovators, and entrepreneurs. FAR tabled the event along with other FSU organizations such as PIC (Program in Interdisciplinary Computing), the High Performance materials Institute, the Learning Systems Institute, as well as the Colleges of Fine Art, Medicine, Business, and Arts & Sciences. The speeches of Stacking Layers II can be viewed on demand here.